Earlier today I wrote about the recovery of an October 1950 episode of What’s My Line? and mentioned that the 16mm kinescope recording was started early, meaning the episode is incomplete. That’s too bad. However, because the recording started early it captured the last six minutes of the program that aired before What’s My Line? on Sunday, October 1st, 1950: a game show called Celebrity Time. No episodes of that series are known to exist, so even just a fragment is big news. Personally, I’m more excited about the recovery of the Celebrity Time fragment than the What’s My Line? episode because it features Kyle MacDonnell as one of the regular panelists. She can be see briefly in the fragment from roughly 1:39 to 1:46 but unfortunately doesn’t say anything. The fragment runs for more than six minutes but that includes a teaser and two commercials. Here’s the full fragment. The guest panelists are Kitty Carlisle and Zachary Scott. Joining Kyle as the permanent male panelist is Herman Hickman. Celebrity Time premiered as a local WCBS-TV game show in November 1948 under the name The Eyes Have It. Douglas Edward was the first host, replaced almost immediately by Paul Gallico. Conrad Nagel took over as host in December 1948. It joined the CBS Eastern network in January 1949 under the name Riddle Me This. The concept was simple: four panelists (two men competing against two women) tried to identify people and events from old newsreel footage and other films. In April 1949, the series moved to ABC where it gained both a sponsor (B.F. Goodrich) and a new name (B.F. Goodrich Celebrity Time or simply Celebrity Time). John Daly and Ilka Chase were at that point the permanent male and female panelists, joined each week by two guest panelists. In April 1950, it moved back to CBS. 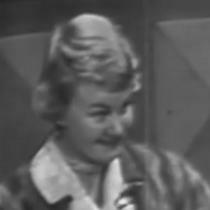 Kyle MacDonnell appeared in a few episodes as a guest panelist before replacing Chase as the permanent female panelist in late April or early May 1950. The series was off the air for 13 weeks following its June 25th broadcast. When it returned on October 1st, Herman Hickman had replaced Daly as the permanent male panelist. Kyle stayed with Celebrity Time until March 1951. The series was on the air until September 1952. It’s unknown how many episodes were broadcast during its nearly four-year run but until this fragment was recovered, no footage from the series was known to exist. You can read all about Kyle MacDonnell in my article Kyle MacDonnell: TV’s Forgotten Star. I’ve also revised my list of Surviving Kyle MacDonnell Programs to reflect this recovery. I now know of 11 surviving programs or partial programs featuring Kyle. Paul Gallico (one of the hosts) was also a novelist. He wrote the novel Poseidon Adventure, among other things.